After much anticipation, some of the most frigid air this winter – and this late in the year on record – descended on the Lower 48 United States this weekend. Cold even by January standards, it is here to stay for several more days. Widespread temperatures in the minus-20s to minus-30s or colder invaded the northern tier on Sunday morning, sending wind chills below minus-50 in spots. Including Monday, below zero readings have been recorded as far south as the southern portion of the Central Plains and into the lower Midwest and Great Lakes region. 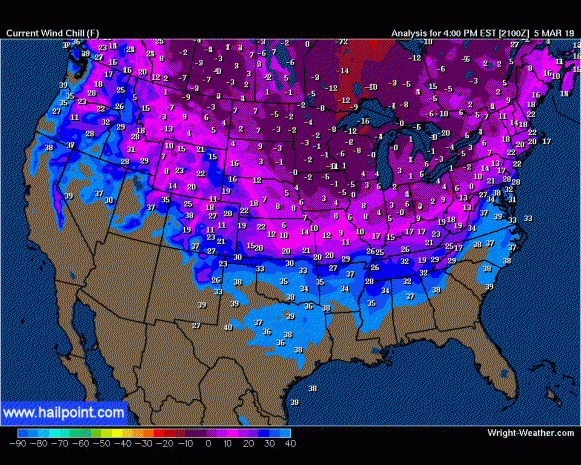 Sunday also featured a coldest low of minus-44 degrees in Montana and a warmest high of 88 in Florida. That made for a remarkable 132 degree temperature difference across the Lower 48.